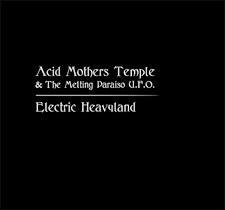 Acid Mothers Temple and the Melting Paraiso U.F.O. - "Electric Heavyland"
It seems that every time I breathe, Kawabata Makoto and friends are putting out a new CD. But the quality of their prolific output definitely shows why they are one of the top psych/space/psychedelic freakout bands currently going. Electric Heavyland continues the high trend, and although I haven't heard much of the Japanese collective's earlier material, this one is probably the best of what I have heard. The 16-minute Atomic Rotary Grinding God/? Quicksilver Machine Head grabbed me by the brainstem right away, with its spooky extraterrestrial intro that jumps suddenly with an electric shriek into the kind of crazy wall of noise jam Acid Mothers Temple do so well. Koizuimi Hajami's drumming, in particular, rocks throughout this one, with Cotton Casino and Higashi Hiroshi's synths on constant space war mode. About halfway through, it slips off the edge into a reprise of that eerie intro, before exploding again in a monster Hendrixian jamfest, with Makoto's manic guitar soloing tearing the roof of the sky off its hinges. Loved and Confused gives us gigantic, loping riffs a la Black Sabbath, with the band providing a dense cloud of noise to fill every empty space while Cotton Casino chomps and tears at it with insane shrieks and space screams. After about 10-minutes, Makoto's guitar frenzy kicks in again, and the synths and electronics start wailing and squalling like caged animals. Phantom of Galactic Magnum starts off mercifully quietly, with little more than some gently bubbling electronic noises, undercut, slowly at first, by cool metallic sheets of noise till the band can no longer restrain themselves, and off they go again, this time into a chaotic, all over the walls, floor, and ceiling mess of Jurassic guitar wailing and cosmic synth detonations. Zounds! There is nothing remotely subtle about Electric Heavyland, but then, knowing the band, and considering the title of the album, would you expect anything less? Another great, soul shaking, mind-blistering trip from these Japanese masters. Visit the band at their web site: http://www.acidmothers.com. The Alien8 Recordings web site can be found at: http://www.alien8recordings.com.